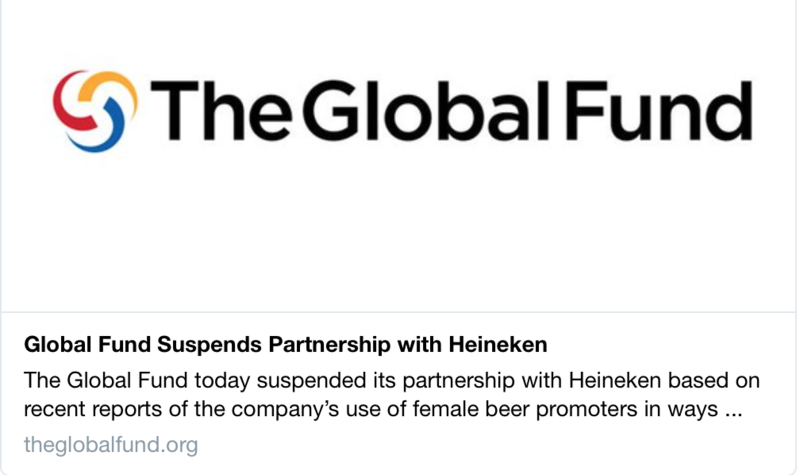 Yesterday, 29th March, the Global Fund announced that it was suspending (not rescinding, suspending) its partnership with Heineken. On the face of it, this should be grounds for celebration, but it’s only a partial victory. Jaws began to drop all over the world – is the Global Fund actually partnering with the alcohol industry, that’s the al-co-hol industry?! Isn’t there an oversight mechanism, or a code of conduct, or just a friend that could have said to Sands – you know what, let’s not do that. Apparently not. Sands was facing his ‘Mugabe Moment’ – that moment when you do something that seemed like a good idea at the time, but actually wasn’t. Crucially, however, when the criticism comes, you take a step back, reflect, and do the right thing – concede the error, apologies, and move on. Dr Tedros did that after his monumental gaff of appointing Robert Mugabe as one of WHO’s goodwill ambassadors (yes, he really did make that appointment), but gained kudos for doing so. Sands did not do that, isn’t doing that; in fact, he’s making the matter worse, even now. 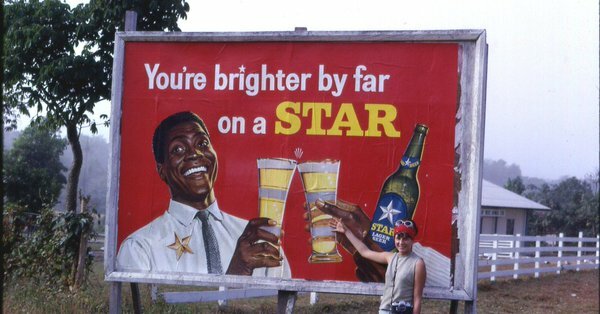 The Heineken debacle took a couple of novel turns last week, one with the almost Onion-esque charge by Chance the Rapper that Heineken was racist because of its lager tagline “sometimes lighter is better”; the other, an accusation that Heineken ‘promotional girls’ working in bars and cafes in various African countries were being sexually assaulted during their work. 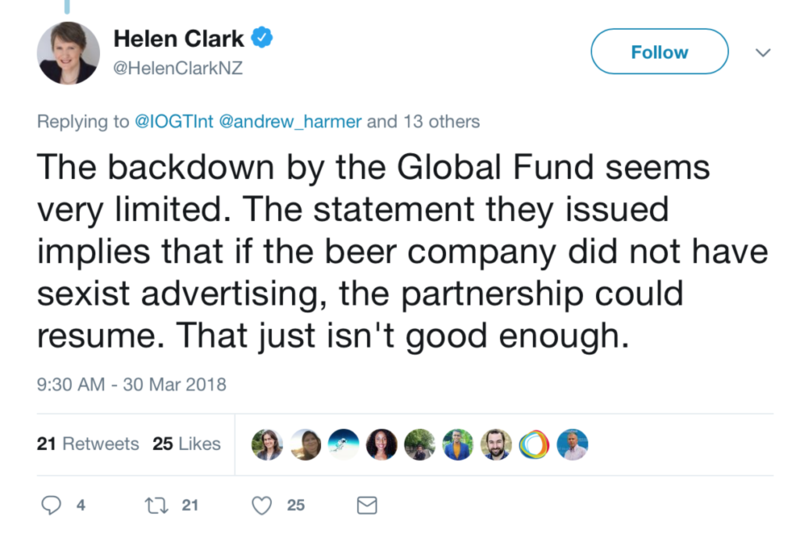 This was too much for the Global Fund, leading to its statement yesterday: “The Global Fund today suspended its partnership with Heineken based on recent reports of the company’s use of female beer promoters in ways that expose them to sexual exploitation and health risks”. And later this morning, Clark tweeted: “Exactly right. The Board should take the opportunity to close down the partnership”. And so it goes on, with public health professionals fuming at the Fund’s inability or unwillingness to join the dots between Heineken…Alcohol…ill-health (in all its permutations – illness, social determinants, gender). So what next? Breaker-of-the-news Benjamin Meier offered this suggestion: “With the @GlobalFund suspending its partnership with @Heineken, it is necessary to have a larger debate about TNC engagement in #GlobalHealth governance (across organizations), developing rules to limit corporate partnerships that undercut #PublicHealth”. That debate cannot come too soon. Unfortunately, the head of the Global Fund has been almost mute over this whole sorry episode, which does not augur well. More optimistically, Anders Nordstrom tweeted earlier “We have requested the board’s ethics and governance committee to review the @GlobalFund partnership policy and they have agreed to do so @PeterASands @UlrikaModeer @HelenClarkNZ @MartenRobert”. 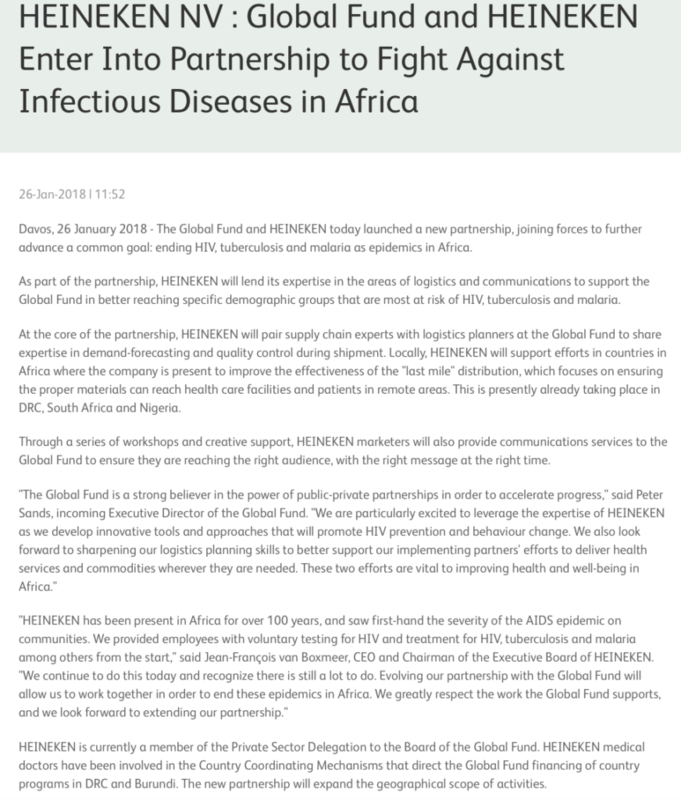 Let’s hope the Fund acts on that request, and in doing so remembers that it is not just a financing partnership but a public health partnership too.